ssh! | I Code Raven! 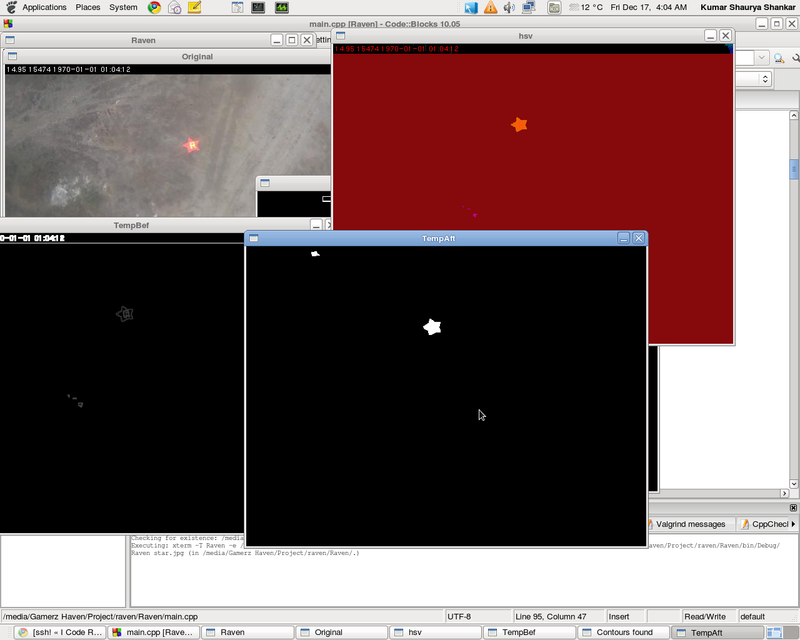 So, today’s work entailed getting file transfer working between the beagleboard and my linux box, getting the Axis camera communication over the network working and modifying the detection code to accommodate the smaller sizes of the shapes I had to detect. The code seems to be working okay for now, but a nagging issue is the disappearance of very small targets – that happens because of my Pyramid based mean shift filter blurring off the colour, because the image is so small. That will be fixed once we get better images. Also made a few rearrangements in the lab workspace setup, and now work with two monitors, keyboards and mice! So, realized that to get file transfer working between the two required a protocol of sorts. So tried using scp, only to be greeted with ‘Connection Refused’ errors. Realised that openssh-server needed to be installed on my box as well. Did that, yet no dice. Then realized that I had to get the ssh server up and running as well! So enabled the ssh service, ran it, and ensured that ssh was allowed in the system firewall list. A simple wget command on the beagleboard got the image to the beagleboard, and a subsequent scp command did the job in transferring the image to my linux box. Now, the in the next flight test, what is intended is that the beagle will acquire images from the camera every second (or at a particular time interval) and then transmit that image down to the control station. Eventually, as and when we get the digicam/dslr, a similar job will be done by the board, in addition to any preprocessing/analysis required. What I’m thinking of doing is offloading part (or the entire processing job) onto the beagle. But that, of course, requires testing, and almost certainly optimizations. That seems some way off as of now however. Also used opkg for the first time on the beagle. Don’t know what really is going on too well, but it seems like a lighter version of dpkg. A gcc download required a opkg update first, and it downloaded some .gzs. No gcc-c++ however. Surprisingly, however, opencv 2.1.0 was present, so installed it. Compiling the code on the beagle. Building a shell script/C code to automate the capture and transmit job (using scp). I realized that I could alternately simply use a rsync after each image grab. Will try, and decide. Working on the camera-PC interface. Will be getting a camera to experiment on tomorrow, so will see how to go about that.